Twenty-three years before Jamestown, there was Roanoke Island. The settlement didn’t survive, but the history, adventure and family fun did. 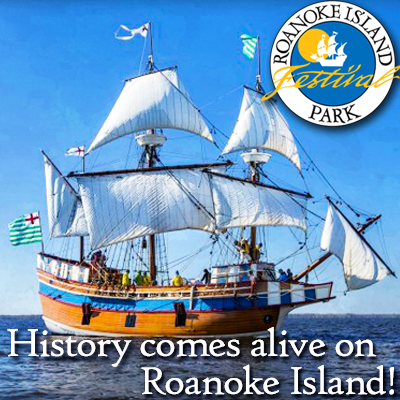 Roanoke Island Festival Park is an interactive family attraction that celebrates the first English settlement in America. Visitors board and explore the park’s centerpiece, a representational ship called Elizabeth II, which looks just like one of the seven English ships from the Roanoke Voyage of 1585. Climb aboard and help costumed 16th-century sailors set the sails, plot a course with an astrolabe, and swab the decks. Turn the capstan to raise the ship’s anchor, play checkers with a wily sailor, and search for surprises in barrels and boxes aboard. Test out the straw and feather mattresses that gentlemen aboard the ship were lucky to sleep on. The interpretive staff of sailors gladly answers questions about the ship, the historic Roanoke Voyages, or any other inquiry guests have about the beginnings of English-speaking America. Return to shore and try traditional woodworking, play Elizabethan games, or watch the blacksmith fashion his wares at the Settlement Site. There, visitors will find additional costumed interpreters who demonstrate what daily life was like for the first English military establishment in the New World. Search the canvas tents for goods and supplies, try on armor, and practice your Irish accent with some of the settlers. Explore Coastal Algonquin culture and history in American Indian Town, an exhibit that’s new to Roanoke Island Festival Park. The town represents an American Indian community similar to what the English explorers investigated and surveyed during their voyages to Roanoke Island and the surrounding area in the late 16th century. Two longhouses represent the historical homes of American Indians from the region. One of the longhouses interprets the home of a leader from the community and stretches over 30 feet long. A smaller and partially completed longhouse includes an interactive component that invites visitors to help complete the structure and also features a Dance Circle. Both areas contain interactive exhibits that focuses on the developing relationship between the American Indian and English peoples during the late 16th century. The exhibit has a planting and harvesting area where visitors can learn the advanced nuances of American Indian farming techniques. Three work shelters include activities like cordage (rope) making, mat and basket weaving, net mending, food preparation, tanning hides, fishing, boat building and gathering. If you wonder about what happened on the Outer Banks after the Roanoke Voyages, discover 400 years of the region’s history in the interactive Roanoke Adventure Museum. Guests amble through the museum at whatever pace they like on a self-guided tour through the historical developments of Roanoke Island and the region at large. Read about the history of the area, wear Elizabethan costumes, or listen to Stumpy the Pirate as he jokes about the infamous Blackbeard down in Ocracoke. Learn about another “lost colony” on Roanoke Island—the Freedmen’s Colony. Imagine what it must have been like to participate in the Battle of Roanoke Island during the Civil War. Study a map of shipwrecks that go back in history through generations and give this stretch of the Atlantic Coast its notorious nickname, “Graveyard of the Atlantic.” View a shad boat that designer George Washington Creef built in 1887 and volunteers and staff from the Roanoke Island Maritime Museum restored over a century later. Find out about the boat building, hunting, and fishing traditions of the Outer Banks, and encounter the beginnings of the tourism industry that made the islands what they are today. In the park’s Film Theatre, see The Legend of Two-Path, a mini-movie about two famous Native Americans, Manteo and Wanchese. Honor the vital and vibrant culture, heritage, and traditions of American Indians from the region in our new American Indian Town. The exhibit includes a wide variety of true-to-scale structures, role-play environments, and places to explore, plant, dance, build and play. The Museum Store offers historically themed gift merchandise in the Elizabethan section, a nautical section inspired by the Elizabeth II, a Civil War section, an American Indian section and, of course, a place for pirates. Enjoy the on-site Art Gallery with exhibits that change monthly, the Fossil Pit full of treasures, and the Outer Banks History Center. Stroll across the green grass of the impressive Outdoor Pavilion, or catch a glimpse of the critters, birds and fishes that make the marsh habitat their home from The Boardwalk. The Outer Banks History Center is a regional archive and research library administrated by the North Carolina State Archives, Department of Cultural Resources. Its holdings document the history, development and growth of the North Carolina coast. The 25-acre island park sits across from the Manteo, NC waterfront and is an easy 5 miles from the Nags Head beaches. Walk across the bridge to the Roanoke Island Maritime Museum—just a block away in downtown Manteo—which features a working boathouse and the Roanoke Marshes Lighthouse. Enjoy downtown Manteo’s restaurants for breakfast, lunch or dinner, and spend some time strolling through the town’s cute boutiques and shops. For more information call (252) 475-1500 or visit roanokeisland.com. Books, toys, games, candy, specialty food, jewelry, souvenirs, memorabilia, home decor and more. Any customer can find the perfect gift at our Museum Stores. From trendy jewelry to Roanoke Island Festival Park memorabilia, the stores' selection of souvenirs will satisfy any shopper. Allow three hours to see all our venues. Pass good for two consecutive days. © Roanoke Island Festival Park 2019. All rights reserved.